The good people of the Pen Boutique Ltd. sent me a pen sleeve and a 12 pen case for review. I’ll start with the one I liked, the single pen sleeve in brown. Fun fact, we can’t remember the last time the complex mowed the grass. I’ve got catnip growing in my backyard! The leather is smooth and sturdy, with the Yak Leather logo stamped at the top. It’s been a perfect little holster for one of my currently inked clipless Vanishing Points. In spite of not having a secure closure at the top I’ve had no issue with my pen falling out. The stitching is neat and even. And the leather smells AMAZING. I wish there were some way for you to be able to smell this through the internet. It smells like Good Leather. Picture me, sitting at my desk, covertly sniffing this leather pen sleeve, because it’s so good I just want to keep smelling it. I also kept smelling the catnip. It smelled like mint! 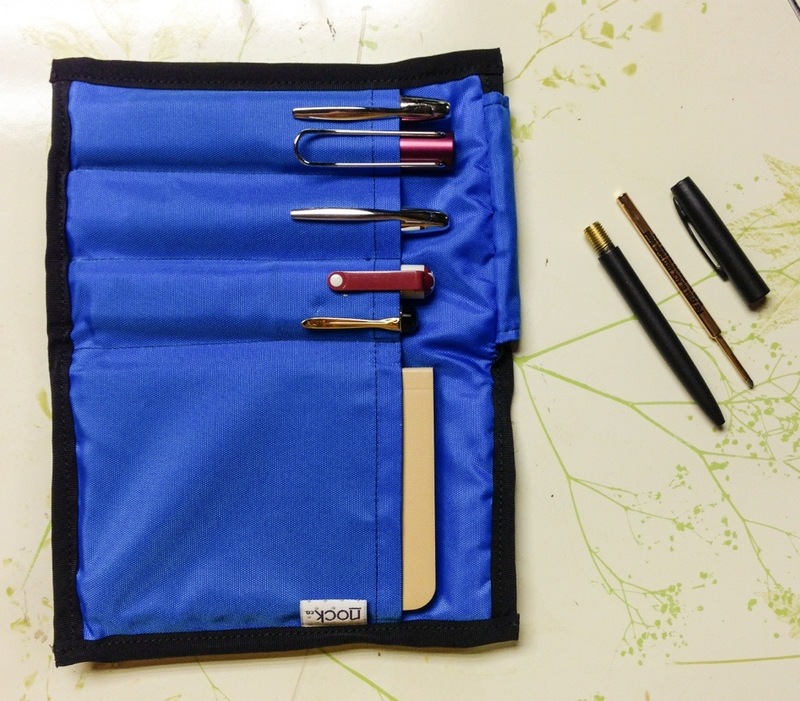 There’s not much else to say about the pen sleeve—it’s a straightforward product, made well. The sleeve, I’m keeping. Then there’s this 12 pen case. The good: it’s also seemingly well made. You’ve got protective cushioning to the covers, two zippers with leather pulls. The leather is a pebbled texture, which I’m guessing will better hide any blemishes it may pick up. The zippers unzip far enough to almost get it to lay flat when open (perhaps with time the leather will relax to do this without needing help). The velvety divider in the middle is removable, presumably so you can use it to lay a pen out on, the better to look at. Or the better to one day forget to put back in and lose. Hey, look, a size comparison! Now for the perplexing and annoying. This case is an inconveniently large size to only be carrying 12 pens. I can easily fit 12 pens in a Nock Sinclair and only take up half the space. Maybe if all of your pens are those honking jumbo oversized novelty fountain pens–but even those don’t fit! The pen loops used here are not intuitive. At first I thought these were just excessively wide leather loops, and this case was only for people who like big, chunky fountain pens. It wasn’t until I saw a YouTube review of the case that I realized there were elastic loops underneath the inflexible leather loops to hold pens in place. But unless the pen you’re putting in comes to a point, you’ll have to use two hands to finagle reaching under the leather loops to hold up the elastic loop and slide the pen in. When the case only holds 12 pens, I presume it’s meant to be carried on the go. But this case is too large and cumbersome to properly put pens back into to be one I wanted in my everyday carry. But it might just be me, that’s why I’m giving it away! You might love it! I might just be crazy! Since I can only afford so much postage, I’m going to limit this giveaway to the U.S. only. Just leave one comment on this post any time between now and May 31st 2018 11:59 PM Eastern Standard Time. One winner will be picked at random from the comments section of this post. Only one comment per person! Comments in excess of one shall be deleted. The comments will be numbered in the order they are received, i.e. the first comment is #1, the second #2, and so on. I will hand-number the entries because that’s still just how I roll. The Random Integer Generator at random.org will be used to pick the number of the winner. I’ll post the contest winner on June 1st 2018. Winner will have one week to email me. There’s a link to my email at the top of the right sidebar. The pen world is fueled by chasing the new. Must have new ink. Must have new pen. Must have new notebook, new case, new stickers, new washi tape, anything out there so long as it’s new. Or at least new to you; vintage collecting isn’t exempt from the madness. It’s not a hedonic treadmill, it’s a hedonic runaway train barreling through my wallet and leaving scores of barely used, briefly effused-over products in my wake. I have so many things acquired that I haven’t even gotten around to reviewing yet—things that burned with the white-hot need of acquisition in the moment, the heady intoxication of having that thing, carrying it everywhere for a week, perhaps two, and then slowly the excitement fades, a pen is cleaned, tucked away in a storage case, forgotten for a while, because there is some new pen out there and I must buy it. It’s exhausting. I’m exhausted. I have all these wonderful stationery objects which I’ve barely taken the proper time to appreciate. I haven’t taken the time to use them to create, because I’ve been so preoccupied with the never enough hamster wheel of consuming. 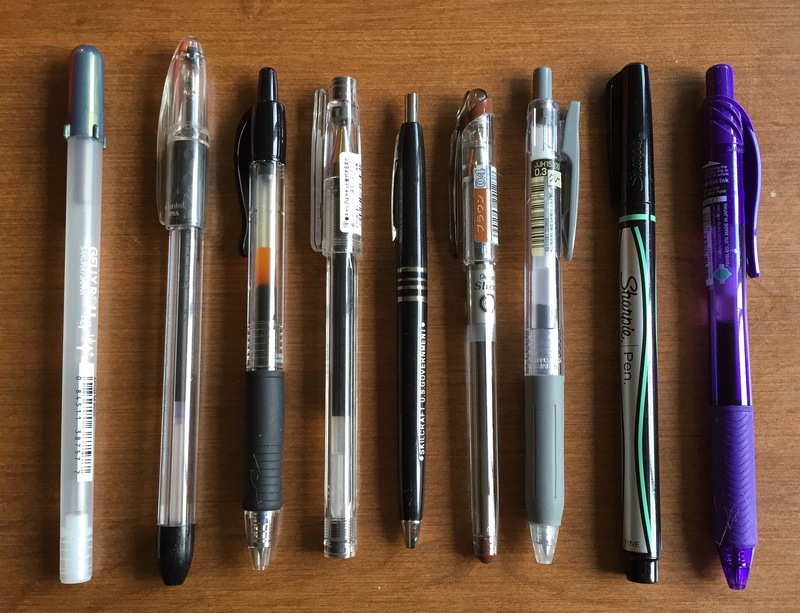 I suggested to a friend that I was going to cut down on buying pens—“but you love pens!“—as if by not buying more pens, my whole vast collection would suddenly vanish. As if there isn’t a small shop worth of barely used products in my possession, ready to be organized and ‘shopped’ through with fresh eyes. I’ll still be going back through the things I love, I’ll still do reviews, but I’ve got to take a pause from chasing the new. Let me show you an example born from this shift in mindset. I bought this pen, grouped with several others, back in…2016? Yes. 2016. It needed a new sac. I gleefully photographed it along with the rest of my newly bought DC Pen Show hoard, moved it to a holding tray, put the tray by my desk in the garage, and there it sat for a year, unthought of, untouched. I’m sure at the 2017 DC Pen Show I looked longingly at pens just like it, because the patterned red hard rubber (especially this wood grain swirl type) has always appealed to me, and yet intimidated me because it seemed like they were all so expensive (for someone with no idea what vintage models were what). This year at DC I picked up a wicked cheap lever filler fountain pen with a flex gold nib that also needed a new sac, which finally prompted me to acquire a proper selection of resacking tools and supplies. With supplies in hand, naturally I had to resac as many pens as I could, which included this guy. It’s a fantastic little pen. No gold nib, but for a firm nib it’s satisfyingly smooth. And even more satisfying is the knowledge that I fixed the pen. There’s a deeper level of ownership knowing I brought it back to life. The smooth matte red hard rubber has faded to a more fall-appropriate reddish orange. The imprint, Wahl Eversharp, can barely be read, but it doesn’t matter. The pattern is gorgeous and the pen is great for every day use. It’s a new crown jewel in my regular fall line up. I’m not going to stop buying new pens forever. But I’m not going to keep buying with reckless abandon. 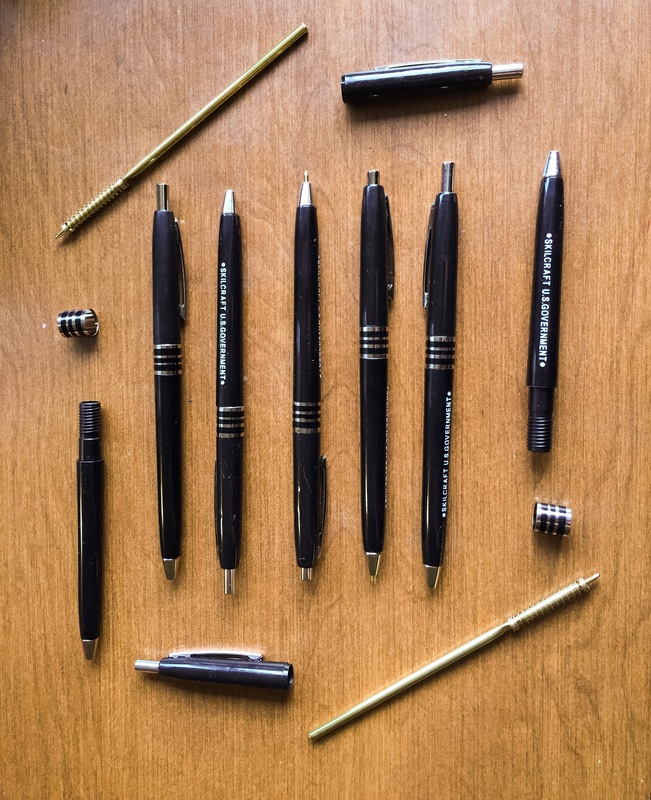 There’s going to be a lot more careful consideration before adding pens to an already great collection. More continuing to do my own repairs and modifications on pens I already own. Focus on enjoying what I have, and selling what I don’t enjoy to fund any future purchases. 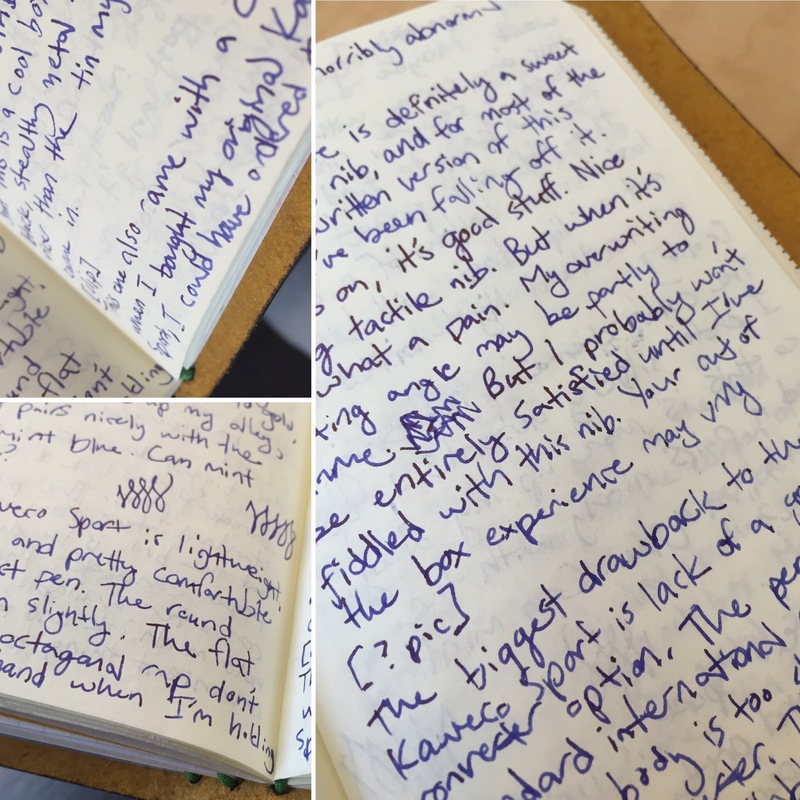 If you have a very good memory, you’ll recall that I’ve reviewed the Kaweco Sport before. Years ago, in fact. 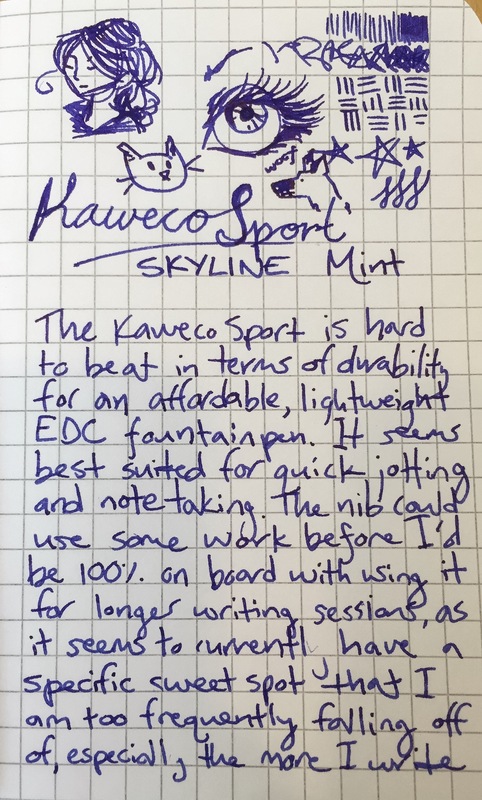 So why am I reviewing a Kaweco Sport again? Well, it’s the Skyline edition with different colors and this one has a clip and it came in a different box all the way from Australia. First off, a general update on the durability of the Kaweco Sport — my original survived a trip through the washing machine without damage and without coming open/putting ink all over my clothes. When the feed broke (for no apparent reason) after 5 years of service, Kaweco saw my Instagram post and got me in contact with their customer service, who sent me a new feed/nib/grip assembly. Great customer service. Very durable little pen. I don’t know if this is the box specific to the Skyline edition, or perhaps specific to a certain geographical distribution area, but this is a cool box. Matte black, stealthy metal tin. Much nicer than the tin my Liliput came in. Kaweco Skyline is evolving! 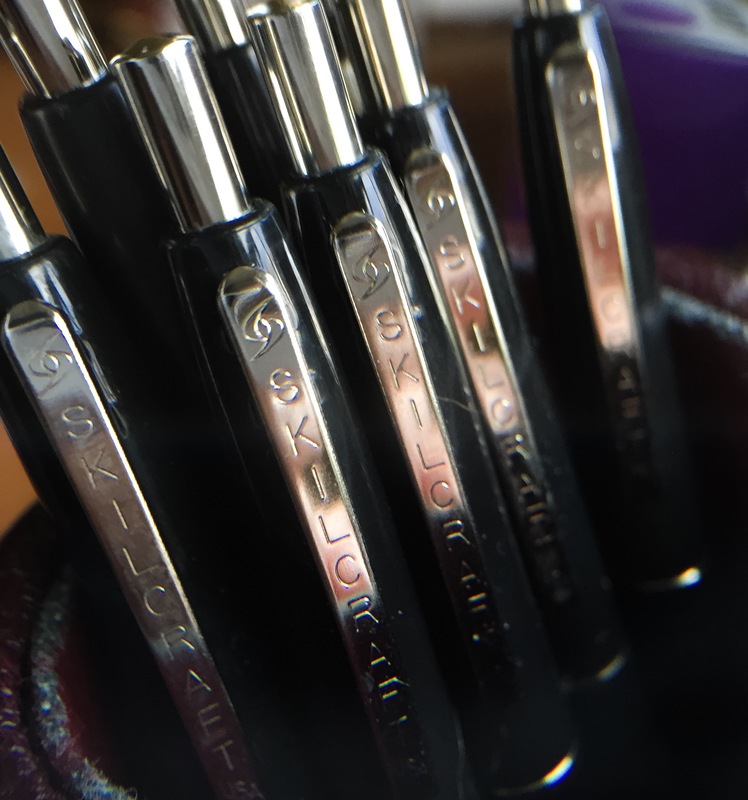 Kaweco Skyline has learned clip. It’s super effective! This pen also came with a clip. When I bought my original Kaweco Sport, I could have ordered the clip separately. Maybe I will. I still can. I’m glad this one came with a clip–it’s sturdy and secure, and help makes the pen easy to find, clipped to the side of a pocket rather than lost in the bottom of a bag. It’s not a clip that will be easily or accidentally knocked off. The color scheme is refreshing. I prefer silvery accents to gold, so this is more up my alley. And it pairs nicely with the soft mint blue. Can mint be blue? The Kaweco Sport is lightweight, being plastic, and pretty comfortable for a compact pen, with its round, slightly curved-in grip. The flat sides on the octagonal cap don’t dig into my hand when I’m holding the pen in my horribly abnormal grip. There is definitely a sweet spot to this nib, and for most of the handwritten version of this review, I’ve been falling off it. When it’s on, it’s good stuff. Nice flowing tactile nib. But when it’s off, what a pain. My overwriting angle may be partly to blame. But I probably won’t be entirely satisfied until I’ve fiddled with this nib. Your out of the box experience may vary. Oddly enough, I seem to have little to no problem when I’m using it to jot a quick note, be it at work on a post-it, or on the back of a receipt while on the side of a mountain on a motorcycle trip. It’s just this more longform stuff that brings out the less cooperative aspects of this nib. The biggest drawback to the Kaweco Sport is the lack of a good converter option. The pen takes standard international cartridges, but the body is too short for a proper converter. There’s a squeeze converter available, which doesn’t hold much ink and isn’t the most convenient thing to use, and a mini twist converter that similarly fails to get the job done. The Kaweco Sport (without clip) used to cost $15 when I bought my first one, which made it a competitively priced entry level fountain pen. The higher that price goes, the harder it is for the Kaweco Sport to remain in that category. It doesn’t have much competition in the compact/pocket size entry level fountain pen front, but for how long? At least you know the money gets you something durable backed by a responsive company. All in all, the Kaweco Sport remains a decent little fountain pen well suited to everyday carry. The Skyline colorway is a welcome addition to an enduring product line. 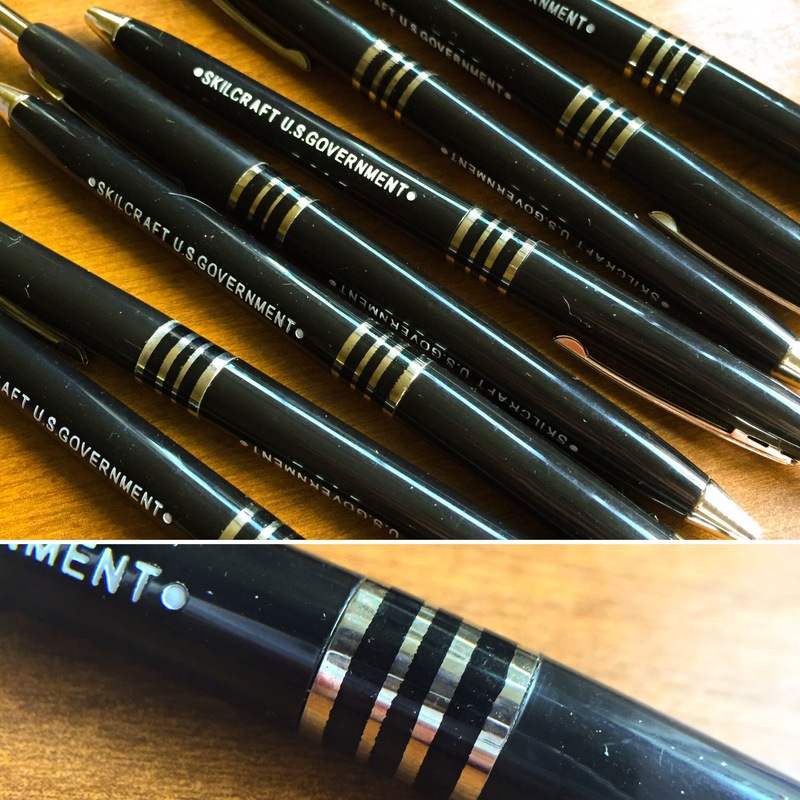 When you get an email with an offer to try “The official pen of the United States Government,” you can’t say no. That’s how you make bald eagles cry, and George Washington would not be pleased with that. 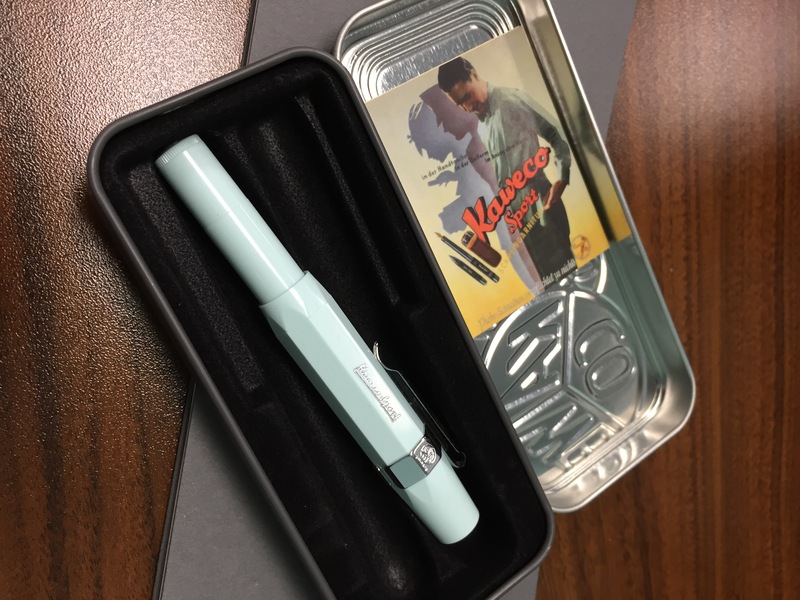 These pens look like a retro throwback straight out of some non-existent idyllic past (a.k.a. the good old days). 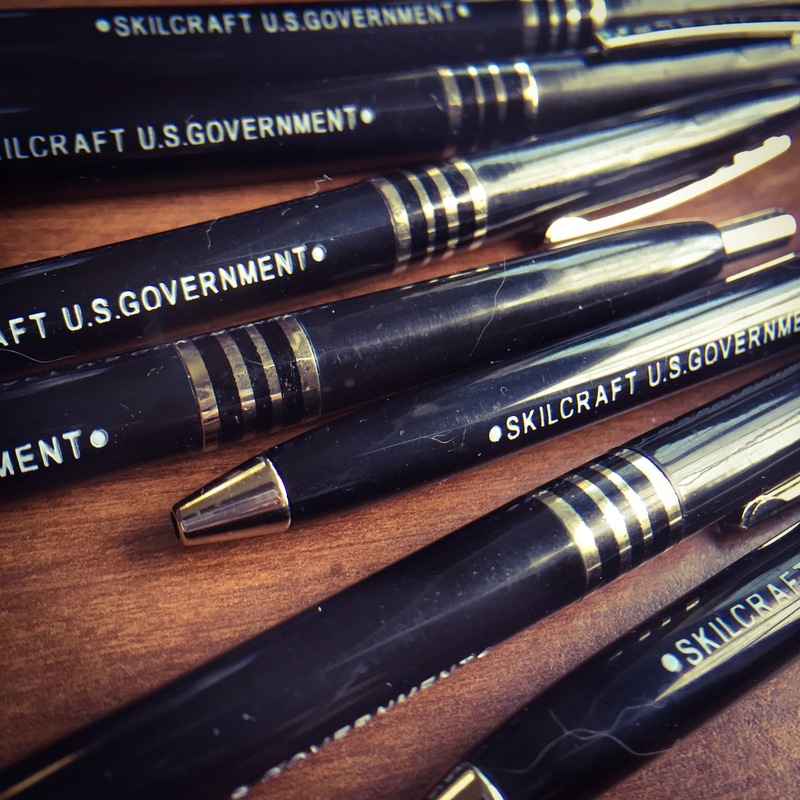 I dig the stamped-on “SKILCRAFT U.S. GOVERNMENT” label. But wow, these pens are tiny. Granted, I’m comparing this to normal, full sized pens. Maybe it actually aspires to the compact carry category? Makes me think about the size of a 1950s McDonald’s meal vs. now. Cheeseburgers of a rational size that look microscopic in comparison to the heaving patty towers of the modern era. I digress. This is a short, slender pen, light of weight and modest of design. The knock is a slim button, but with a strong and satisfying click. There’s a decent amount of resistance to it–when you deploy the pen, it’s a deliberate action. This! Is! Government! Business! Some minor quibbles – alignment. The clip doesn’t line up with the label. The metal spacer ring in the middle mostly lines up, but you can feel the slight edge line between the plastic and the metal. Psychologically, I really want the words to all be in a line, and the surface to all be impossibly smooth. The refill is a bronze-bodied affair rumored to last for a mile (I don’t have paper long enough or patience sufficient enough to make over 5000 one foot long lines to test this claim). 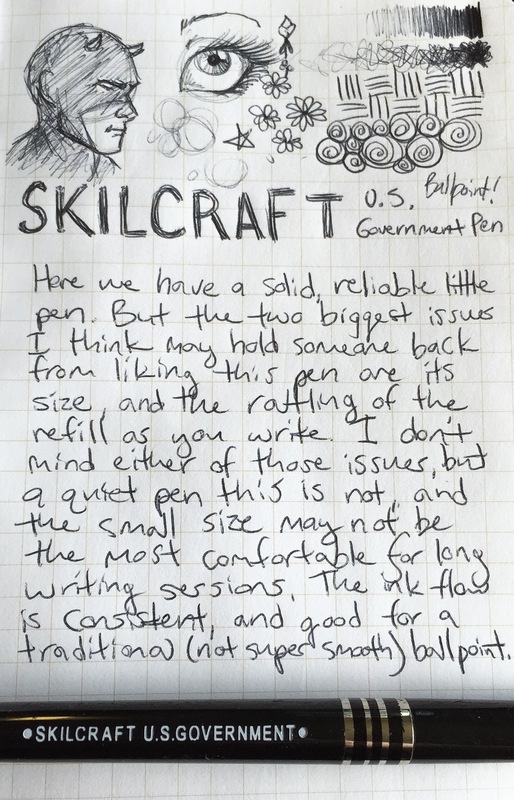 It’s no modern marvel–compared to the super smooth ballpoint kings, the Skilcraft refill is lighter in color and not as smooth. It’s good when it gets going, no blobs. 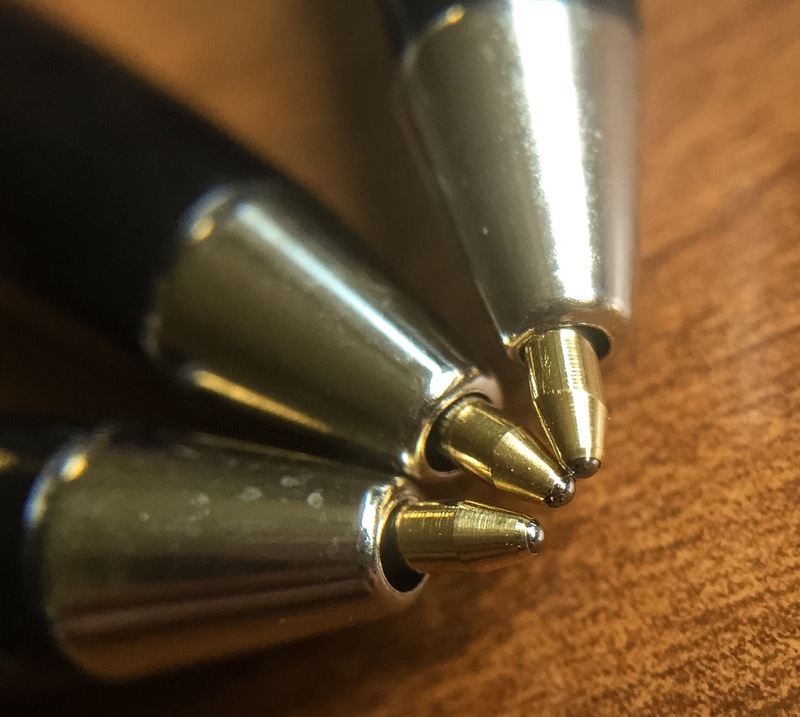 There’s about half a millimeter of play laterally between the refill and the end of the barrel, the result being a soft but not unpleasant sound as you write, like a gentle tapping with each pen strike on the page. If you like tactile things, it’s a bit zen-like, your own personal write-powered white noise generator. If you crave absolute silence, then this could at times pose a problem. This pen seems designed to be as unobtrusive as possible while still retaining usability as an everyday jotter. I doubt this would be very comfortable for a marathon note-taking session, but for quick notes such a slim pen tucks away easily to be ever-available. It’s stood up well to several months of abuse thrown in various bags without care. I find myself including one in each of my bags, in case I need a normal people pen, especially one I won’t have to worry about loaning out or losing. Available wherever they are sold. Like Amazon, apparently. And probably other places. A little more about Skilcraft – it’s the trade name of the National Industries for the Blind, employing those who are blind or visually impaired. Let me just link to the Tiger Pens Blog post about Skilcraft, which has a fantastic and fascinating write up about the company that makes these pens. 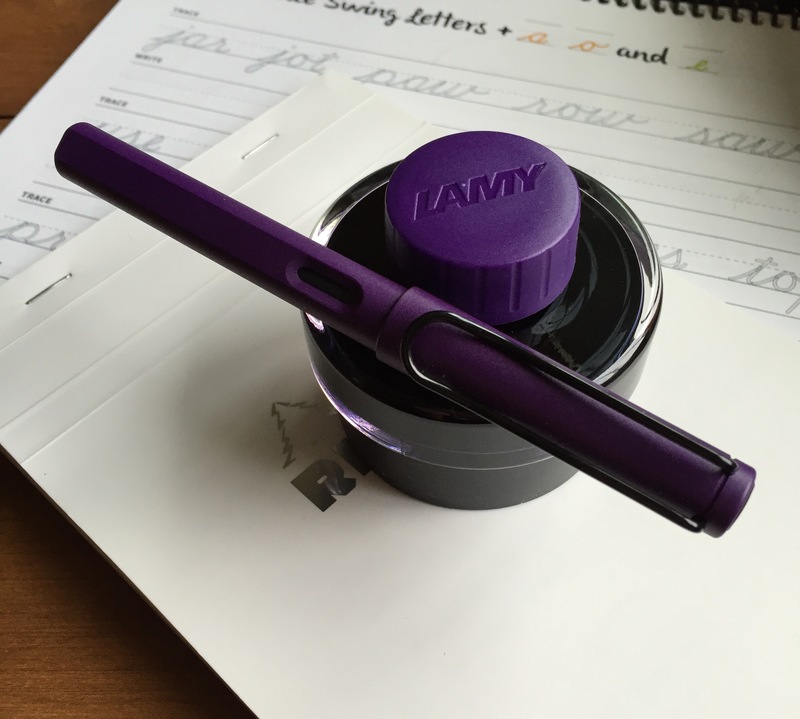 A review for the much anticipated Lamy Dark Lilac Safari doesn’t need to be long. Here it is: just buy it. Unless you hate purple, or purple murdered your parents outside a movie theater forcing you into a life of vigilante justice against purple-jacketed villains, then you can pass, but everyone else? You probably ought to get this pen, and the ink to go with it. I hate triangular grips, and I still think you should get this pen. 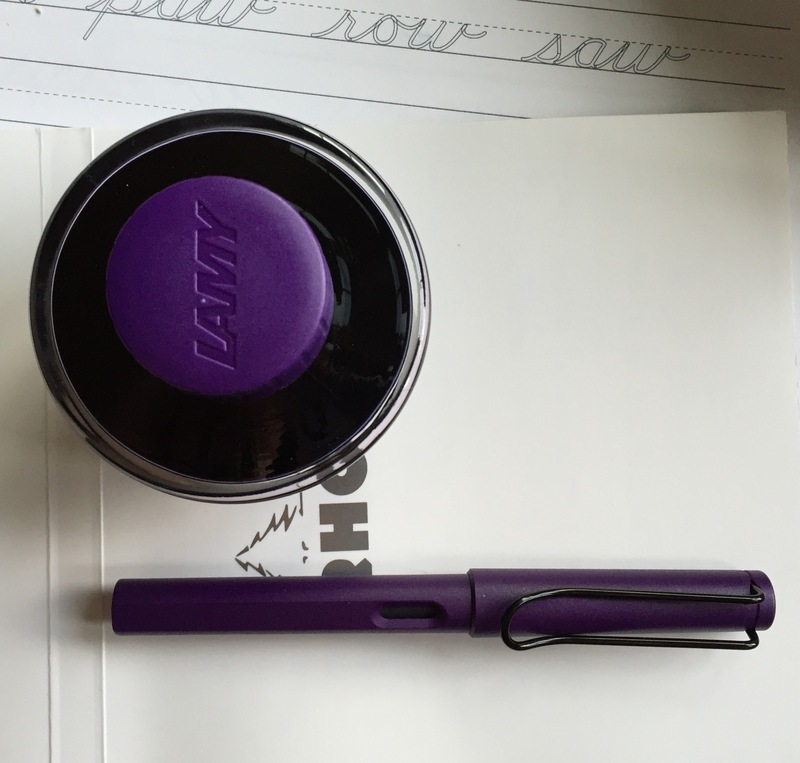 Ultimately this is still a Lamy Safari, and my opinions about the Safari haven’t really changed (though it’s no longer the sole best contender for a beginner fountain pen, not since the Pilot Metropolitan hit the streets). But I will tell you what makes this particular Safari a winner among all other Safaris. 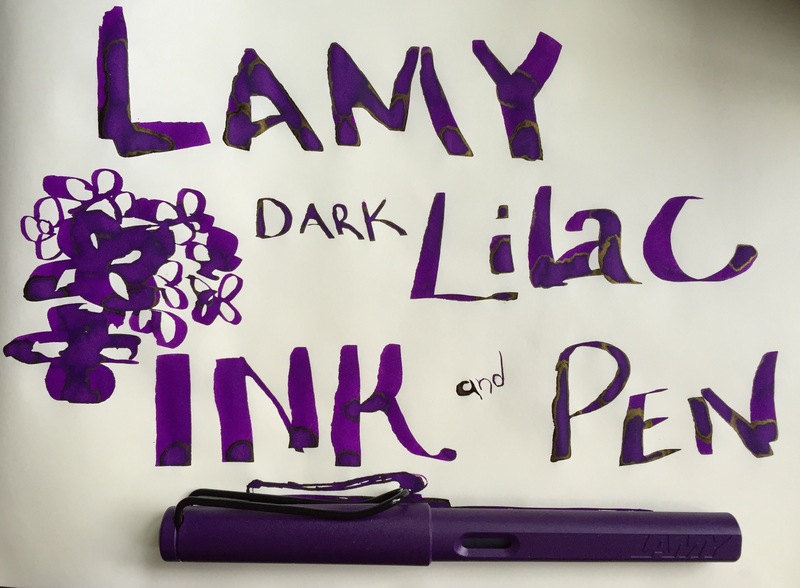 I don’t know if the success of the Pelikan M205 Amethyst led them to this conclusion or if Lamy came up with this one all on their own, but special edition pens can be made in colors other than green. With fantastic results! I couldn’t ask for a more perfect shade of purple. The entire pen is finished with the same matte texture as you’d find on the charcoal Safari. It’s a wonderful texture that doesn’t show fingerprints the way the glossy finishes do, and adds comfortable grippability to the plastic body. The black nib, clip, and finial seals the deal. Silver accents would have been too showy. The stealth scheme lends the pen an ineffable air of coolness. 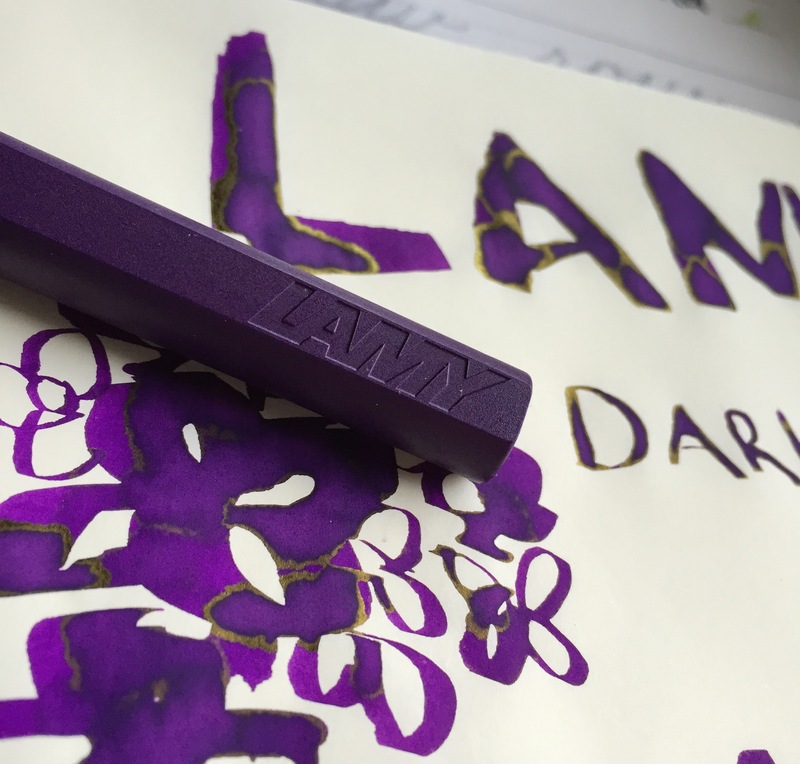 Lamy ink is one of my favorites for everyday use — it’s vibrant, it shades, and it’s fairly quick drying. 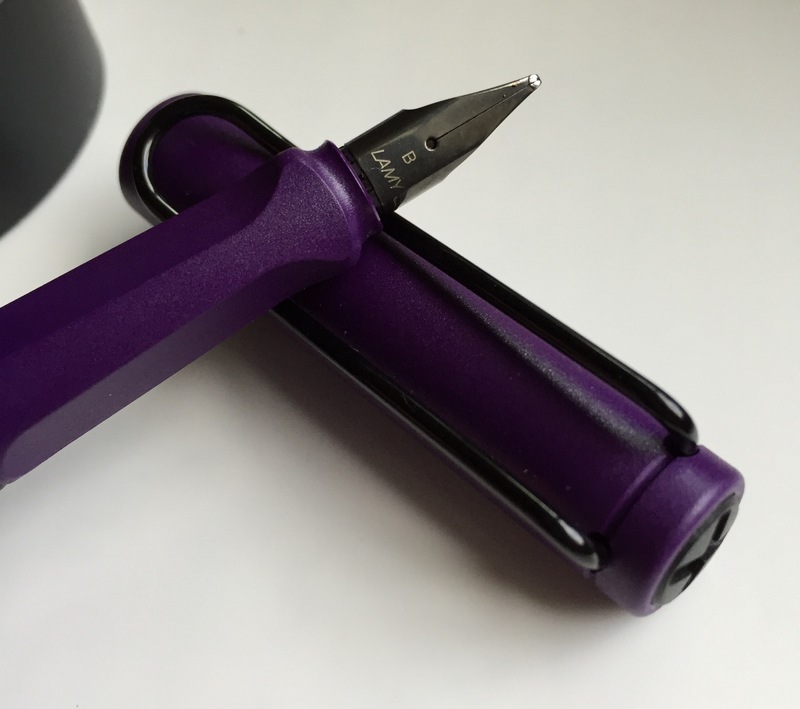 The only downside to Lamy ink is the limited selection of colors available — or, that was the downside, prior to the arrival in the past few years of matching special edition inks. 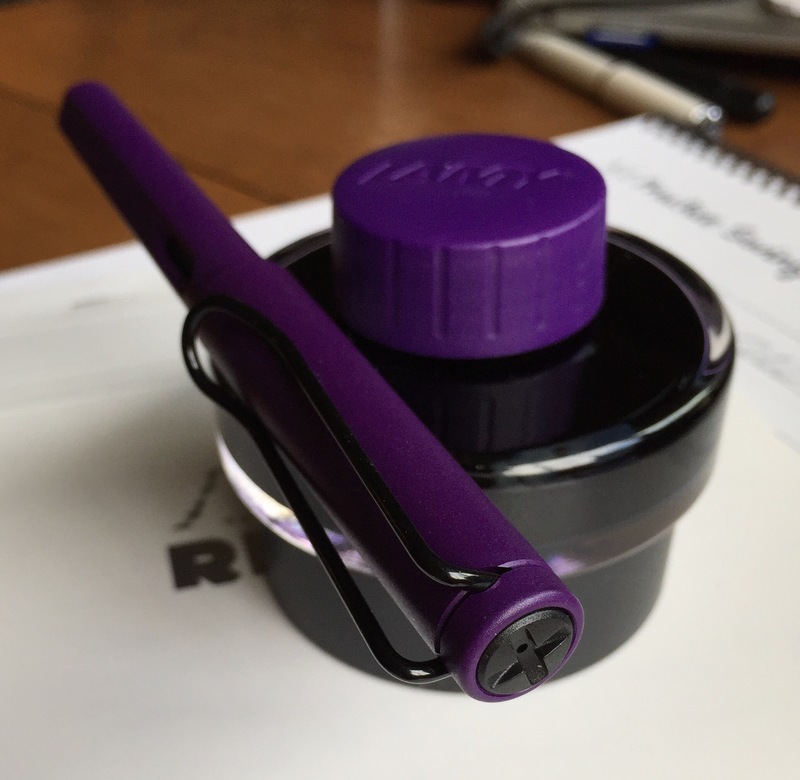 Now I have the purple I’ve wanted to exist since I first learned about Lamy inks. Bonus? The ink has a golden sheen. This pen and its matching ink are everything I hoped for. My only problem is that they didn’t come out with it sooner. I got mine from my local enabler, Crazy Alan’s Emporium. He might have some in stock if you give the store a call. Otherwise you can find this pen for however limited a time at any fine retailer where Lamys are sold, but not yet sold out. I don’t mix politics and pens (pens are for everyone, regardless of whether our worldviews agree), nor did I have the attention span to watch the 35 minute opus YouTube video related to this ink (I’ve tried 3 times and only made it a total of 4 minutes in, but I’ve heard that “it’s a trip” – interpret that as you will), so I can’t comment thoughtfully on the political aspects of this ink. But it’s quite a memorable label, and I don’t think any other ink company has labels as fantastically strange and detailed as Noodler’s labels. The big draws for me on this ink are the quick drying potential, and the red color (I still haven’t found a perfect fall red). Noodler’s Bernanke Blue is the current gold standard in my life for quick drying ink. I haven’t given it a formal review, but I can tell you when I need an ink I can count on, Bernanke Blue is what I load up. The trade-off with Bernanke Blue is that it has no shading, tends to bleed through all kinds of paper (some more than others), and is given to some fuzz and feathering. It doesn’t come out sharp. But it hits the paper dry, yet has no problems starting up even after I haven’t used it in a pen for weeks. How does Berning Red compare? Just as Bernanke is a strong, rich blue, Berning is a strong, vibrant red. It’s not quite firetruck red, more of a warm autumn leaf color. It also has no trouble starting up in my pens after time spent unused, and has given me no dry-outs or hard starts. Good ink flow. 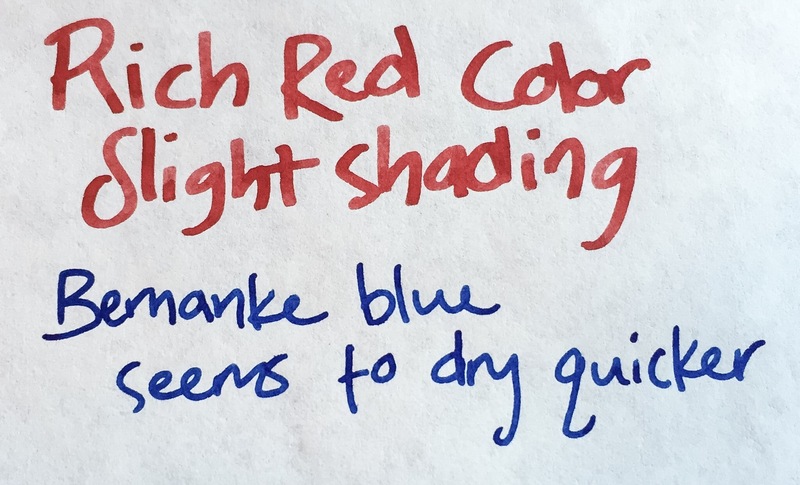 Most excitingly, Berning Red exhibits some shading…on Tomoe River paper. Better than nothing! 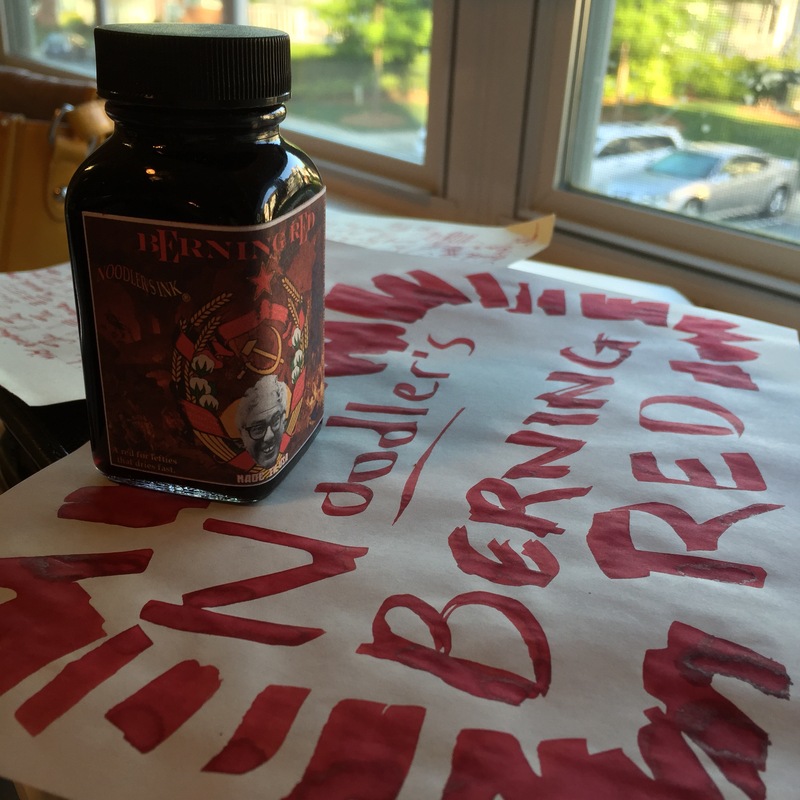 On every other paper besides Tomoe River, Berning Red has the same less desirable characteristics as Bernanke Blue: a tendency to fuzz and feather, to bleed through the page, and just generally fail to deliver a crisp writing line. It’s not the worst, but I’m picky, and generally willing to sacrifice a few seconds drying time advantage if it means ink that will look crisp on the page. I could just use this ink on Tomoe River paper, but on that paper Berning Red loses all dry time advantage; whereas Bernanke Blue dried in about 5 seconds on TR (most paper it takes 1 second, at most 2), Berning Red took 15 seconds to dry, no better than most any other ink. 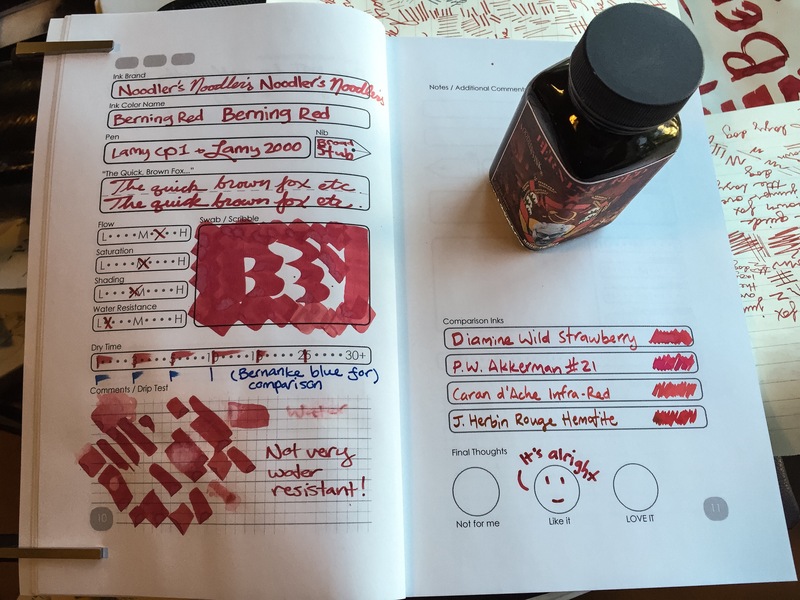 On other papers, dry time for Berning Red varied from 1 second to 5 seconds, maxing out at 25 seconds on the InkJournal paper. It’s mostly a fast drying ink, except when it’s not, and definitely not as quick drying as its close relative, Bernanke Blue. 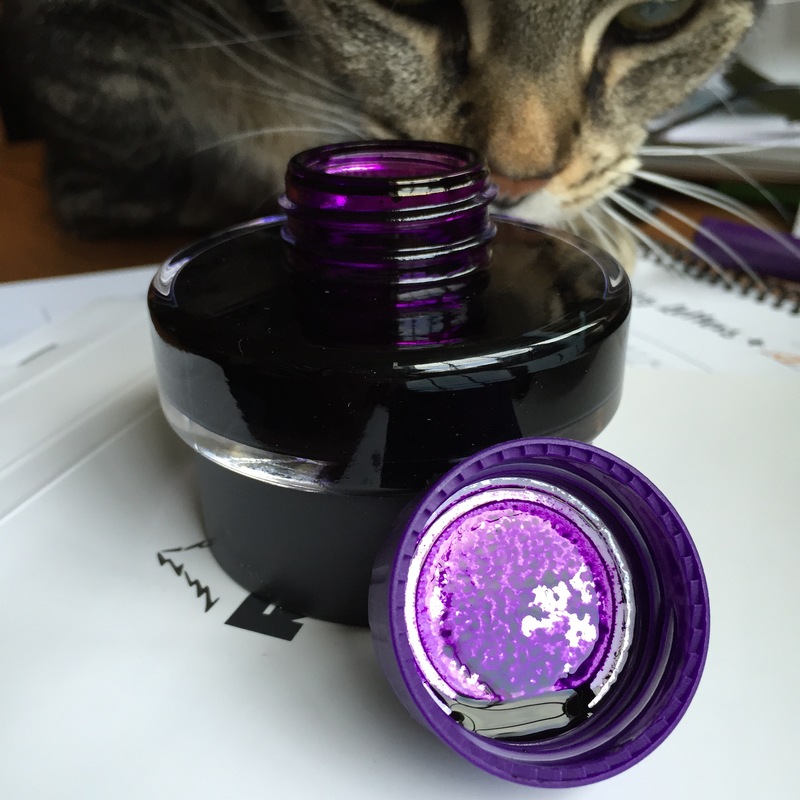 Your mileage will definitely vary based on what pen and paper combos you bring to this ink. 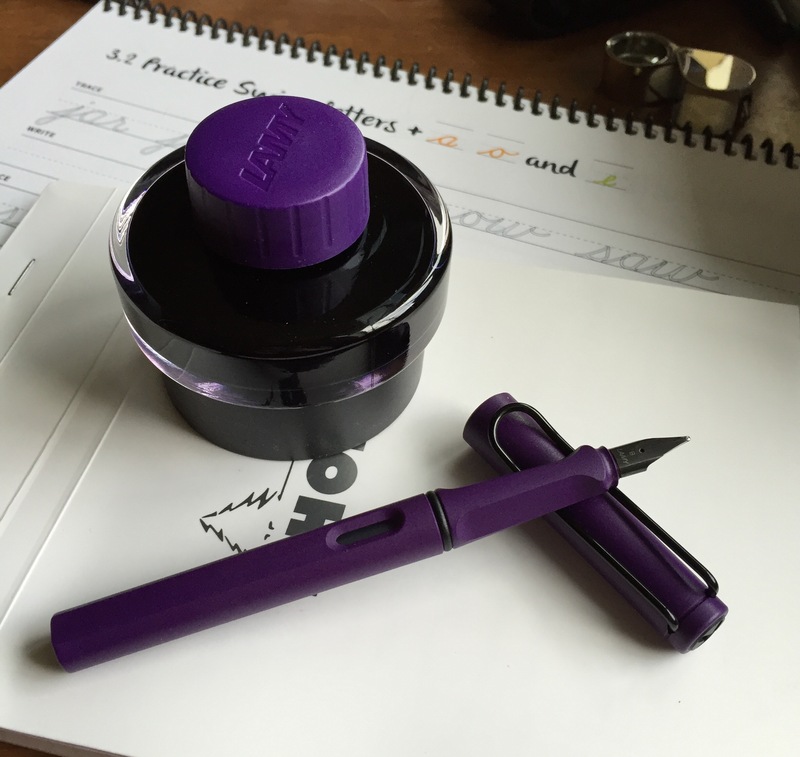 If you’re looking to use it as a quick drying ink, stick to cheaper and conventional papers and probably lean toward a finer nib for a better looking line. If you want the best look out of this vigorous red, then abandon all hope of a quick dry time, and pair a broad and/or stub nib with Tomoe River paper. Ideal for lefties? Eh, it can be, with a thoughtful choice of pen and paper. I took my Nock Co. prototype along for a motorcycle trip to West Virginia. Previous motorcycle trips with pens that traveled daily ended poorly (as rugged as a matte black finish seems, it’s just not cut out for the life of badassery and motorcycle travel). 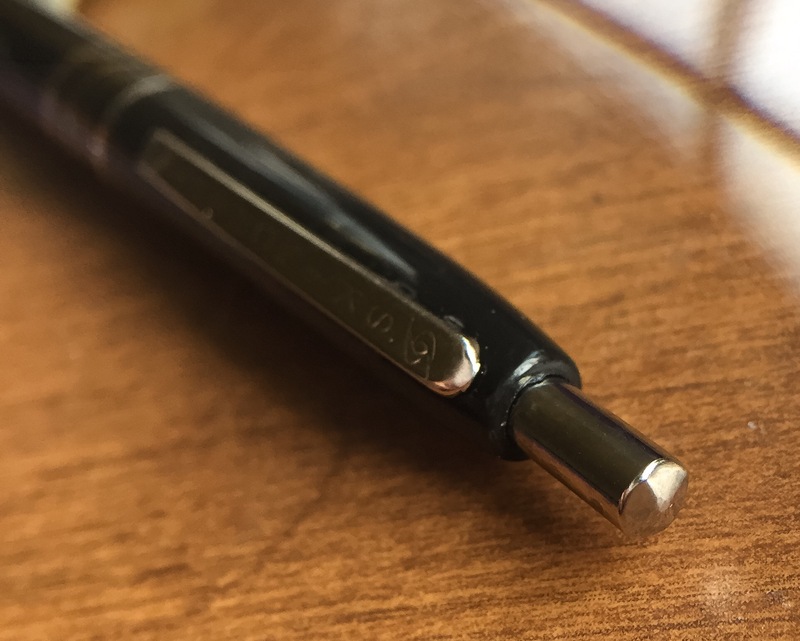 As a control, I also carried a retractable Space Pen loose in my shoulder bag…and here are the results: the Space Pen literally rattled itself completely undone…and all the pens in the Hightower case were just as good as they were pre-trip. Round one durability test success. I’ll let y’all know how it does if I get rained on…though I would definitely prefer to not get rained on.